Mixing classic Hollywood sensibilities with thoughtful genre subversion, William Wyler's The Big Country is an atypical western epic full of striking visuals and layered characters. This new 60th Anniversary edition from Kino offers an improved video transfer over the previous MGM release along with a healthy assortment of new supplements, giving the film the special treatment it deserves. Highly Recommended. The world can be a difficult and dangerous place to navigate at times, and it's often easy to lose one's way out there amongst all the confusion and persistent conflict. Faced with a vast expanse of corruption, greed, and aggression, the only tool one has to stay on the right path becomes a steady moral compass. 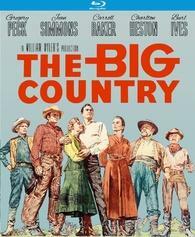 And for James McKay, the noble protagonist of William Wyler's The Big Country, that proves to be more than enough. A western epic about feuding families and opposing ideologies, the film is a thoughtful and sweeping blend of classic Hollywood spectacle and subtle genre subversion -- presenting a cowboy hero who would rather keep his gun holstered than hastily pull the trigger. The story follows James McKay (Gregory Peck), a New England sailor who heads out to the American West to live with his new fiancee, Patricia Terrill (Carroll Baker). Though an easygoing man with a modest demeanor, James instantly clashes with the local Hannassey brothers, a group of troublemaking ranchers. When a bitter decades-spanning feud over land between the Terrill family and the Hannasseys heats up, James unwittingly gets caught up in the middle. With both groups thirsty for blood, he attempts to find a peaceful solution, placing himself right in the crosshairs of both sides. Throughout the film, James is a genuine fish out of water, a sea captain who finds himself thrust into a completely foreign land. And it isn't just the dry terrain and rugged atmosphere that's alien to the character, it's the actual behavior of the angry, childish people around him. Perfectly tailored for the role, Peck imbues the sailor with an effortless air of moral fortitude and inner strength. Humble almost to a fault and rational in the face of increasing hostility, it soon becomes clear that whatever position James takes is likely the right one. This is a man who goes out of his way to avoid a fight, not because of cowardice, but because he doesn't need to prove anything to anyone but himself. And when he does finally spring into action, his call to arms is made all the more powerful and intimidating since it's clear that he's finally found a true cause worth fighting for. The character's peaceful intentions become the thematic core of the film, and the manner in which his efforts are constantly dashed by violent methods creates much of the narrative's drama. All these discordant philosophies are given ample voice by an exceptional ensemble, bolstering Peck's performance with great supporting turns by Jean Simmons, Carroll Baker, Burl Ives, Charles Bickford, and Charlton Heston. Remaining faithful to Golden Age Hollywood bravado, director William Wyler fills the runtime with many striking wide shots of vast Old West landscapes, creating a seemingly limitless Technirama scope. Many action sequences also feature tried-and-true western sensibilities, including an early set-piece that involves some over-the-top trick horseback riding, adding some playful spectacle to the proceedings. With that said, Wyler does break away from tradition in some rather powerful ways, using key techniques to subvert genre expectations. A moonlit brawl between Peck and Heston's characters is especially effective in this regard, furthering the story's examination of violence through an exhausting and atypically awkward fight scene. While the film as a whole features a fittingly rousing score, most of this particular sequence is actually silent, save for the thump of angry fists smacking against flesh and bone. As the sailor and cowboy battle, Wyler cuts to many wide shots, emphasizing how small and insignificant their breathless squabble really is. Similarly, the movie's climax features a brilliantly staged duel that actually plays directly against western conventions, offering a very different kind of shootout. Though its epic runtime might prove a bit much for some viewers, this slow buildup is ultimately paramount to the movie's success, and Wyler manages to maintain a steady pace with no unnecessary padding. As childish bickering between families takes a deadly turn, and greed and hypocrisy lead to bloodshed, it becomes clear that some people simply don't have the tools to effectively navigate the twists and turns of this "big country" that we live in. 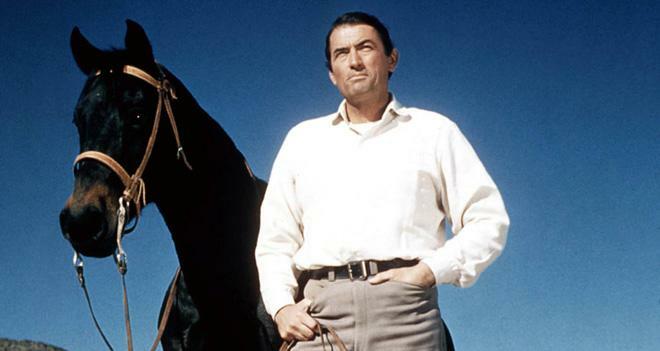 Through James McKay, Gregory Peck crafts a memorable and inspirational onscreen hero, one who somehow ends up simultaneously clashing against and embodying everything a mythic cowboy is supposed to be. At one point during the film, everyone assumes that James has become lost out in the wilderness, that a man of his temperament and bearing could not possibly know where he's going during the dead of night in the Old West. Even when he rejoins the naysayers, they refuse to believe that he actually knew where he was and chalk up their reunion to luck. Of course, the reason he was able to find his way could not be any simpler. He just made a map, took a compass, and followed it -- something every man could stand to do. Kino presents The Big Country on a BD-50 Blu-ray disc housed in a keepcase. After some logos and warnings, the disc transitions to a standard menu. The packaging indicates that the release is region A coded. The film was previously released on Blu-ray by MGM back in 2011. The film is presented with a 1080p/AVC MPEG-4 transfer in the 2.35:1 aspect ratio. Though similar to the last release, this new transfer includes a few notable improvements. First off, the old transfer looks horizontally stretched in comparison to this new video presentation, giving characters an odd, wide appearance on the original release. Thankfully, this new Kino transfer corrects the problem, offering the right proportions. Likewise, general flickering and color pulsing are now virtually absent, providing a more consistent experience. With that said, similar black level fluctuations and subtle horizontal banding in dark scenes are still visible. Beyond these key improvements, general clarity and color fidelity are also slightly refined, but not dramatically so. Like the previous transfer, the main titles are still fairly dirty and damaged, but the rest of the source is basically pristine with just a few very minor specks here and there. A light to moderate layer of fine grain is present throughout, adding a pleasing level of texture to the image -- though the slightly lower bitrate here can give grain a faintly noisy look in skies. Thankfully, the aforementioned improvements to the image outweigh this very small downgrade. Meanwhile, clarity and depth remain great, highlighting all of the film's breathtaking Technirama vistas while rendering intricate fine details on clothing and faces. And while the earthy color scheme and flesh tones don't exactly look natural, the rich, rustic hues pop right off the screen, perfectly complementing the Old West setting. Outside of the black level fluctuations, contrast is well balanced with bright whites that don't overpower the image. Correcting a key flaw found on the previous release while offering a few more subtle improvements here and there, this is an often stunning transfer. The movie is provided with an English DTS-HD MA 2.0 mono track, which, for all intents and purposes, appears to be virtually the same as the previous mix found on the MGM release. With that said, this new track is 16-bit while the last one was 24-bit -- but I did not detect any notable loss in quality from the switch. You can read my original thoughts on the mix HERE. Carrying over the lone supplement included on the last release while adding a comprehensive collection of new extras, Kino has put together a great package here. Audio Commentary – Film Historian Christopher Frayling offers a steady and informative track focused on behind-the-scenes production details and light analysis. Frayling frames the commentary as his way of helping to reappraise the film, providing insights into how certain aspects of the movie may have been overlooked when it was first released. 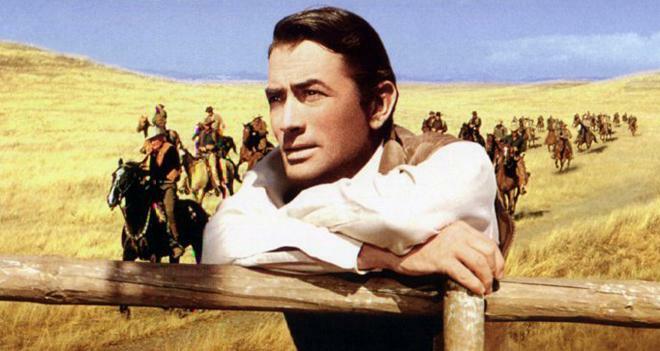 The historian discusses the film's themes, subversive approach to western cliches, and Technirama visuals, while addressing conflicts that arose between the director and stars Gregory Peck and Jean Simmons. This is a very worthwhile listen for fans. Directed by William Wyler (SD, 58 min) – Produced in the 80s, this is a comprehensive doc about the director's storied career, featuring interviews with Barbara Streisand, Gregory Peck, Laurence Olivier, John Huston, Bette Davis, Billy Wilder, Charlton Heston, and more. Likewise, interviews with Wyler himself, shot shortly before his death, are included as well. The participants offer a detailed rundown of the man's path toward filmmaking and approach to directing while mixing in clips from his various films. Wyler Doc Outtakes (SD, 23 min) – Here we get extended interview bits from the documentary with Gregory Peck, Charlton Heston, and Billy Wilder. Interview with Cecilia Peck, Carey Peck, and Tony Peck (HD, 12 min) – Retrospective interviews with Peck's children are provided here with anecdotes about his acting and producing roles on The Big Country, including details on conflicts the star had with William Wyler during the shoot. Interview with Fraser C. Heston (HD, 11 min) – This is a retrospective interview with Charlton Heston's son about father's experience on the film. Interview with Catherine Wyler (HD, 13 min) – In the last retrospective interview, William Wyler's daughter discusses his career, experience with westerns, visual style, and falling out/reconciliation with Gregory Peck. Fun in the Country (SD, 5 min) – This is an amusing vintage promotional piece for the movie narrated by actress Jean Simmons. We are treated to various behind-the-scenes shenanigans between the cast and crew, including a card game between Simmons and director William Wyler, a chess game between Gregory Peck and Burl Ives, and Charlton Heston hunting a turtle... which he then races. So, in other words, despite having no real insights into the film's production, this is the greatest extra ever. 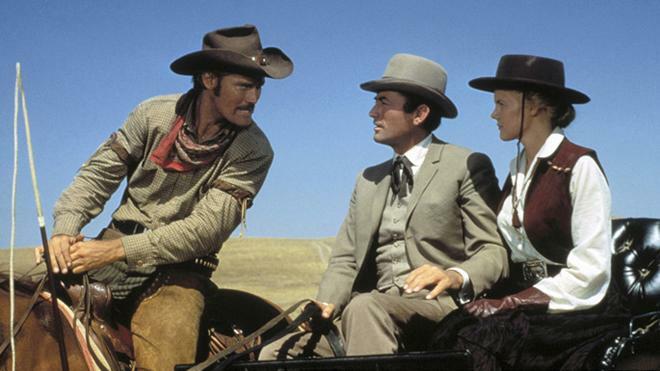 Larry Cohen on Chuck Connors (SD, 3 min) – This brief 2012 interview discusses Connors work on film while lamenting the fact that his movie career never really took off. Animated Image Gallery I (HD, 3 min) – Here we get a reel of stills set to music from the film. Animated Image Gallery II (HD, 4 min) – Another reel of behind-the-scenes production photos and stills set to music from the film is included. William Wyler's The Big Country is an exciting and thematically rich western. Epic and thoughtful, the movie manages to play with and against the conventions of its genre. This 60th Anniversary release from Kino features an improved video transfer over the previous MGM disc, a strong mono mix, and a new assortment of comprehensive supplements -- offering a very worthy double dip. Highly Recommended.